Spanner Re² reports a new success story of its popular wood cogeneration plant: The company just received another big international order for a total of 120 units to be used in applications worldwide. As had been the case in prior major orders, the wood cogeneration plants were selected due to their ideal scalability in megawatt projects: Low investment cost, easy modular combination and ultimate reliability were again the main arguments. Cascade installation of several type HKA 45 Wood Cogeneration power plants enables the easy, highly flexible realization of megawatt plants. A combination of 22 of these HKA 45 plants in Latvia currently produces a combined power of 1 MW electric and 2.4 MW thermal. Depending on local conditions, the power can be either fed into the grid or used on-site. The heat can be used for district or remote heating nets or for on-site purposes. Cascading several individual Wood Cogeneration plants features many attractive benefits: Use of serial components ensures a very competitive total cost of ownership. Planning and implementation processes are simplified and accelerated by simply linking proven standardized single units. Each individual Wood Cogeneration plant works independently of the others, is individually and easily controlled, and can be started and stopped within minutes, enabling individual systems to be switched on or off anytime to meet actual requirements. High system redundancy ensures ultimate availability and easy adjustment to actual consumption. Spanner Re² Wood Cogeneration power plants are especially attractive in areas without gas supply and for operators with good access to regional low cost wood chip or waste wood resources. In the described power range they feature clear advantages over other biomass CHP technologies like steam turbines or ORC plants, especially when it comes to investment cost, efficiency, overall profitability, and implementation speed. In addition, they create regional added value, using a resource that, by contrast to oil or gas, is sustainable and environmentally friendly. Spanner Re² wood cogeneration plants are highly efficient in transforming wood chips into heat and power following the combined heat and power (CHP) principle. They use natural wood chips and offer attractive cost advantages from the use of proprietary, self-produced heat and power. 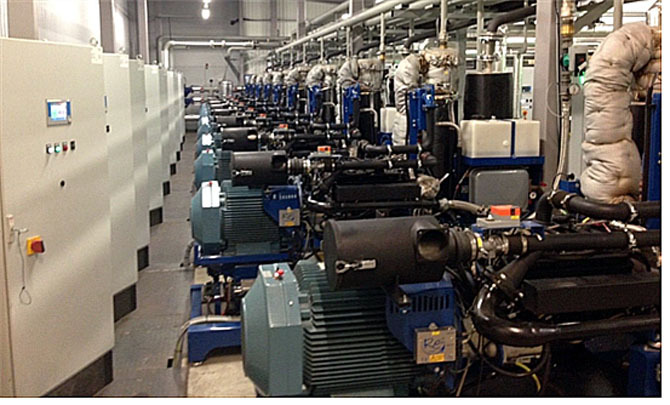 Several hundred Spanner Re² cogeneration plants are in operation in agriculture and forestry applications, hotels and catering, and in domestic and remote heating networks in Europe, Asia and North America.